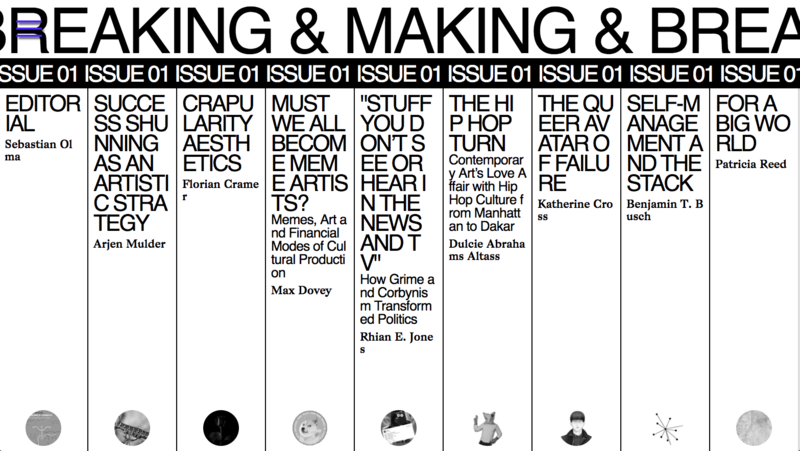 The first issue of makingandbreaking.org delves into questions as to the role of cultural production as a contributing force for emancipatory social transformation. We believe this to be an urgent and difficult question today, given the ways through which much cultural production lubricates neoliberal operations since the 1980’s (especially it’s spurring of inequality); including the plight of critical practices whose modes of antagonism are frequently subsumed. As a result of decades-long neoliberal transformation, many systems of cultural production bend toward ideological machines supporting, whether inadvertently or not, the thesis of capitalist realism; that there is no alternative, that there is no possibility of political propositions that break with our current trajectory. It is against these tendencies that makingandbreaking.org probes modes of cultural production that engage with questions of social transformation. How can our current models for the functioning of art and cultural production be refashioned, reconceived to live up to the claims of participating in social transformation? How can they help to redirect libidinal energies, that are often today co-opted by digital machines of “consciousness deflation” (Mark Fisher), to take on new formulations of futural desire and attachment? How does the category of human experience figure in our global plight, in view of the impersonalization that comes with increasing complexity? In the first issue of makingandbreaking.org artists, curators and theorists reflect on these questions across a wide spectrum of cultural production and geographies. Contributors: Dulcie Abrahams Altass, Benjamin T. Busch, Florian Cramer, Katherine Cross, Max Dovey, Rhian E. Jones, Arjen Mulder, Sebastian Olma, Patricia Reed.